This new Inkadinkado Wreath stamp (introduced tonight) is so beautiful. I stamped it with the VersaMark Ink and then embossed it with Green Embossing Powder. After letting it dry, I colored it with my Copic markers. It was cut and embossed with Spellbinders Label Nine. I love the DP papers from the Madeline Paper Pad and I used the larger print for the main focal paper. The reverse side was then used for a back ground of the wreath after cutting and embossing it with the Labels One Nestie. Punch and also backed with the Burgandy paper. I added a strip of ribbon that I shirred with a piece of thread for more interest. I tied a beautiful bow, but it was just too much on the card. Remember, you can always double click on the images to see a better view. I have several of the new Martha Stewart Punches in stock and will be featuring them next week. The are fabulous and you will be seeing me use them on cards this week. Oh how fun they are! Absolutely BEAUTIFUL!!! Your wreath looks wonderful with these oh, so pretty dps!! I'm really liking that new MS border punch too ... awesome creation!! I received my order yesterday! Thanks so much for the prompt shipping and the replacement item ... it works perfectly! 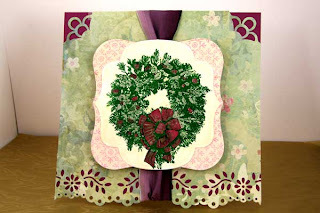 A beautiful card Joan, I love your deep, rich colors! Your wreath is absolutely gorgeous! Lovin' those new MS punches! Wowsy, Joan. BEAUTIFUL! I love everything about this card. The paper, punches, ribbon and the poinsettia all perfect. I hope that punch is in my order. What,I didn't order it? I will just have to wait to see if it is in my shipment. Such a beautiful card Joan. I love the color combo.